Table setting is both a science and a creative art, such as our process of pewter handcrafting. In order to create the perfect table setting you have to follow some specific rules. The one rule for a formal table is for everything to be geometrically spaced: the centerpiece at the exact center, the place settings at equal distances and the accessories balanced. Beyond these placements, you can vary flower arrangements and decorations as you like. Once you've followed the basics of table settings science, then you must be creative adding your personal touch. The secret is to follow a mood or an element, for example a color. Choose the main color and two related colors that agrees with the main one. Additional tip: while golden and striking colors are hard to combine, grey and silver are always a good choice to give continuity to the main color. Take the BLUE for example. 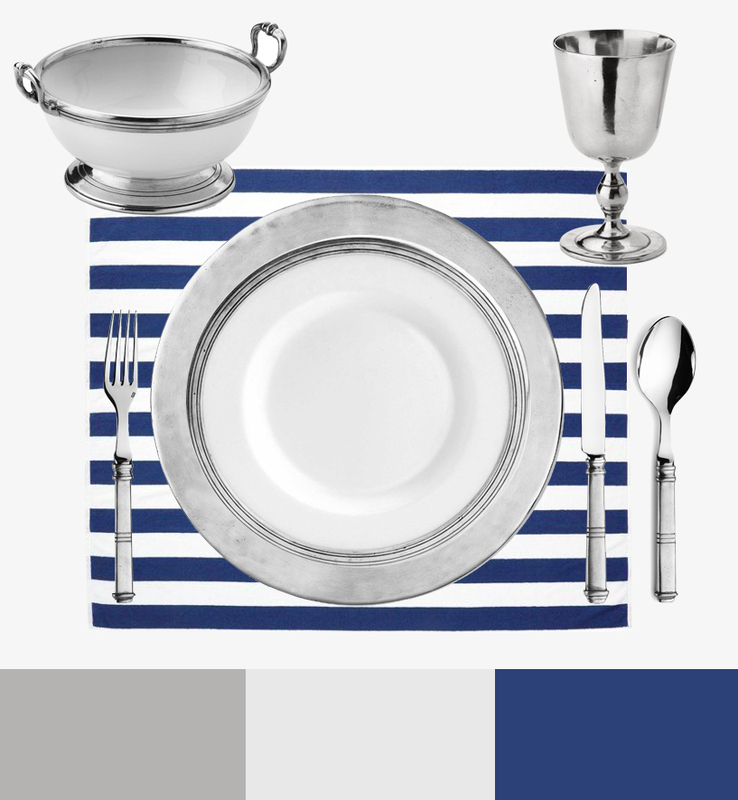 Keep it as your table setting main rule and choose two allied colors such as ceramic-white and pewter-grey. In the above table setting example you see the result. The Marinoni creations placed on the set are the pewter and ceramic small footed bowl, the pewter goblet, the traditional plate charger, the 28 cm pewter and ceramic dinner plate and the Isabella pewter and stainless steel flatware. Everything is placed on a navy-blue and white background. If you will have external colored elements, such as very colorful food, wine and decorations, you can keep GRAY as the main color and play with different hues of it until it shades to white. 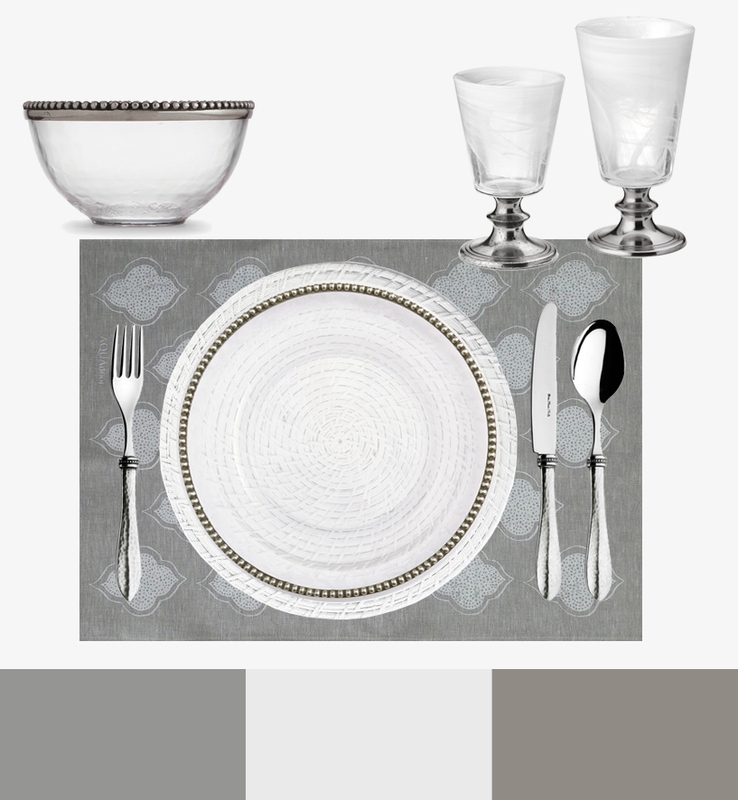 In the second table setting example we used the Bellabianca flatware, both the small and the large pewter and alabaster-white glass, the pewter and tesoro-glass dinner plate and bowl. Do you want to be more natural or to use more than one color? A good idea is to use GREEN and MUSTARD, so that you can also be in agreement with the food you serve. 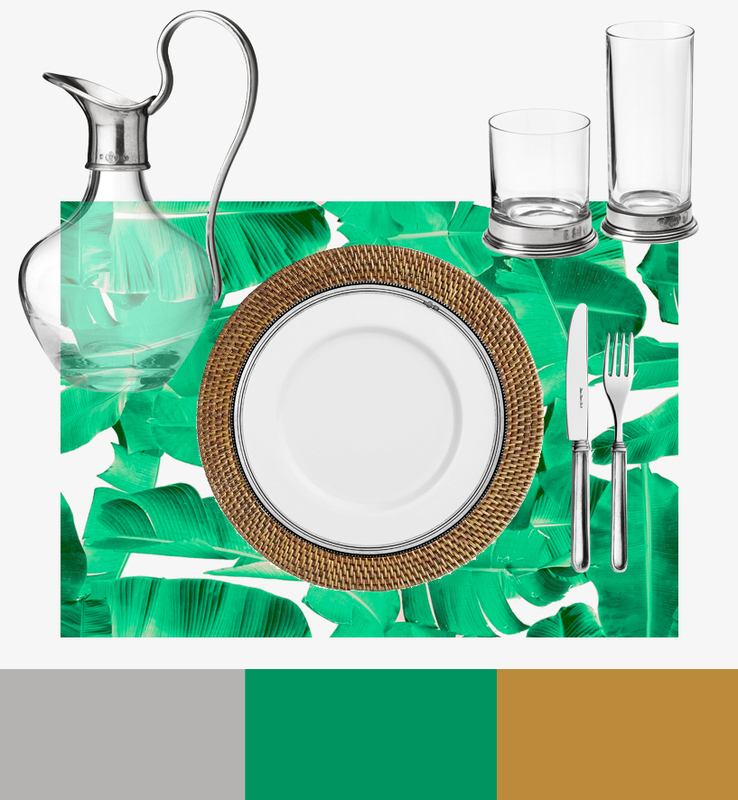 A wicker charger plate is perfect for a natural-green background and it can hold the Marinoni pewter and ceramic dinner plate with a delicately beaded rim. Moreover, in this table setting example we used the Marinoni tall chunky glass tumbler, ideal for long drinks drinks as well as everyday use for water and beverages, the Hiball glass, the Elena flatware set, and the Marinoni pewter and glass pitcher. Not colorful enough for your taste? Then can also use a more shocking and trendy combination: fluorescent PINK and GREEN, always with a touch of grey. This table setting is perfect for a light lunch or a dinner with appetizers, vegetables, fruit, cocktails and drinks. 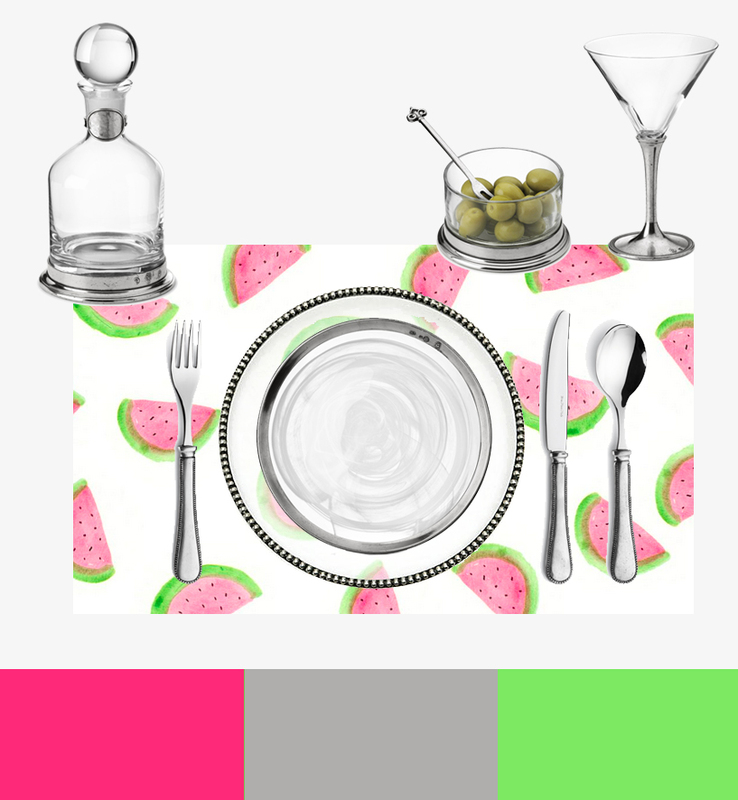 We combined the appetizer bowl, the Martini glass, and the whisky decanter for the cocktail and drinking moment, while lying on a watermelon pattern you see the Regina flatware set, the pewter and glass charger and the Marinoni pewter and alabaster-white plate. The practice of dictating the precise arrangement of tableware has varied across cultures and historical periods. So, according to the country you are in or to the nationality of your guest, you should take other elements into consideration. Do you have a special occasion and you want to create the perfect table setting? Tell us, we'll give you the right advice.